It's difficult to organize digital pictures when they are taken with different cameras by different people. If the pictures are moved to a PC using a USB Pen or a CD-ROM they will lose the original creation date and, consequently, it's going to be difficult to sort the pictures in chronological order, especially if they were shot by different cameras on the same day. 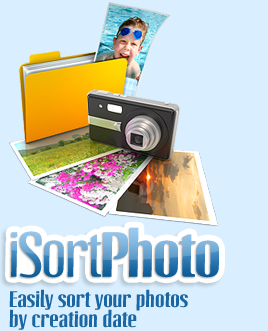 iSortPhoto is a useful utility that solves these kind of problems quickly and easily. • Version 3.0 had the ability to rename video too! • Version 2.0 is a major release, with an expanded and improved interface. - New exclusive options to correct the date when the time of the camera was not set correctly. - Exclusive option to separate the photographs according to the camera used during the shot: it is very useful if you are aware that, after you ordered the photos, one of the cameras had the wrong time. 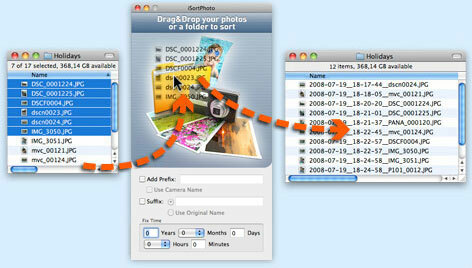 - The application is now able to process the RAW image format in addition to the JPEG format. The formats of the major manufacturers are supported: Canon, Nikon, Sony, Pentax, Panasonic, Leica and others (some models may be not supported). • Version 1.6 improves errors handling. iSortPhoto now discovers subdirectories. Mac OS X Lion compatible. • Version 1.5 adds an option in the Preferences to choose how to read and write the date. It's now possible to Drag & Drop images on the application icon in the Dock. • Version 1.2 is now able to work in background. EXIF Engine completely rewritten. Memory leaks fixed. Some bugfixes. • Version 1.1 adds the ability to to correct the time: this is useful if the camera clock was not set correctly – for example if you forgot to set daylight saving time or to change the time zone.